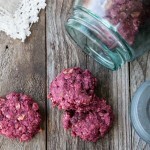 Beet, Honey and Walnut Energy Cookies fuel runners, toddlers, pregnant mamas and anyone in need of a sweet fix in this hurried and busy life. My husband ran 50 miles. I’ll repeat that … 50 MILES!! Yes, he’s a bit crazy No one (or almost no one) does this or would want to put their bodies through this. He finds solace and peace in running, clarity and focus in the continuous pace. He’s introverted, running is his solo-time as a parent, husband, and business owner. It’s a way he not only survives this extrovert world but thrives in it. I support him, encourage him and feed him, to fuel this passion. Before his big 50 mile race, I was questioning him daily with what foods he would like, need or want for the race or leading up to the race. While dinner the day before would be crucial, breakfast the morning of, and snacks for mid-race were also important. Hence the inspiration of these cookies. I thought they would be good to eat, pre-race and during the race. 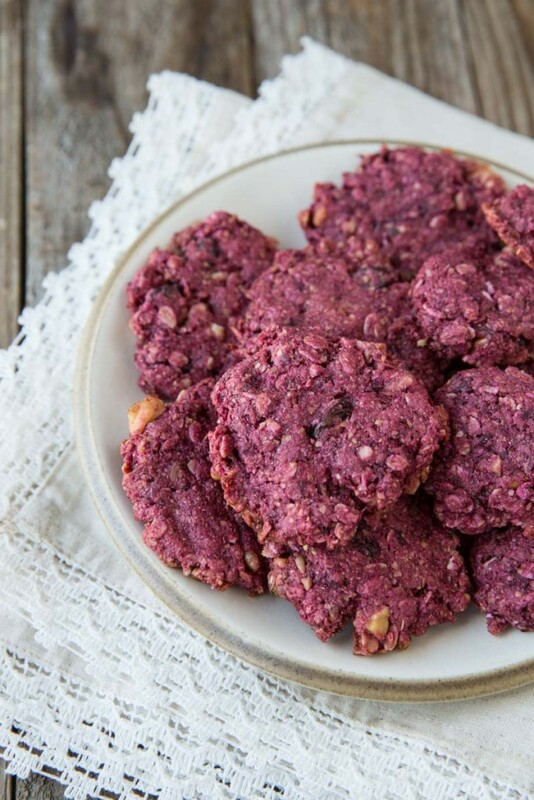 I started out to the store for ingredients for a similar energy cookie but with carrots then looked in my fridge and saw beets. I asked Josh which he’d prefer and he said beets. Turns out my toddler also prefers the fun bright pink vegetable over the more familiar orange carrot. Who is not motivated by bright magenta cookies. I assembled these little gems over at a blogging friends home and she also approved. They are really not as weird as they seem. She said, “I would totally take these on a hike or bike ride!” We chatted food, sampling each others recipes, meanwhile Everett (my kiddo), couldn’t keep his paws out of the bowl of raw dough. Luckily, this cookie dough is totally edible (no eggs or potential harmful raw ingredients). And again after the cookies came out of the oven, Everett kept eating them. 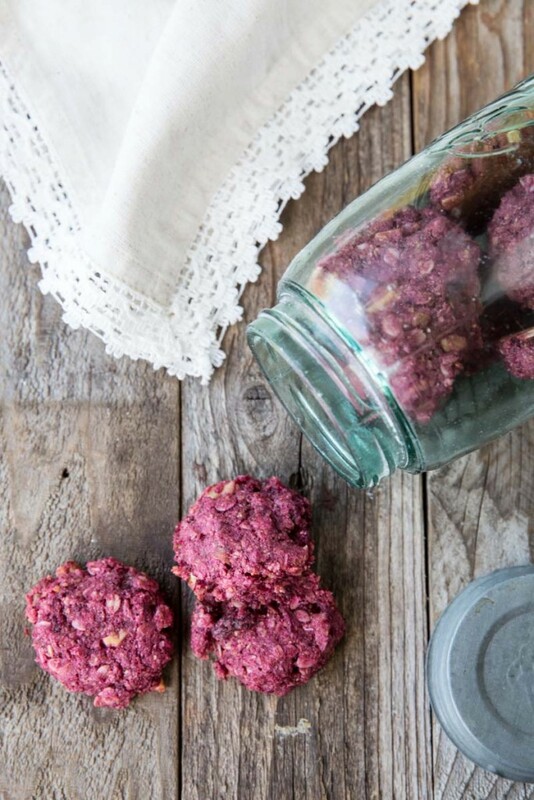 They’re addicting, easy to eat, little guilt-free treats. I had to stop him after quickly consuming a few (or as many as he could before I could stop him) only because we were making these for dad and his big run. We brought these to the race weekend in a jar and all of us continued to eat them, fueled and happy. A bright pink success in all of our books! 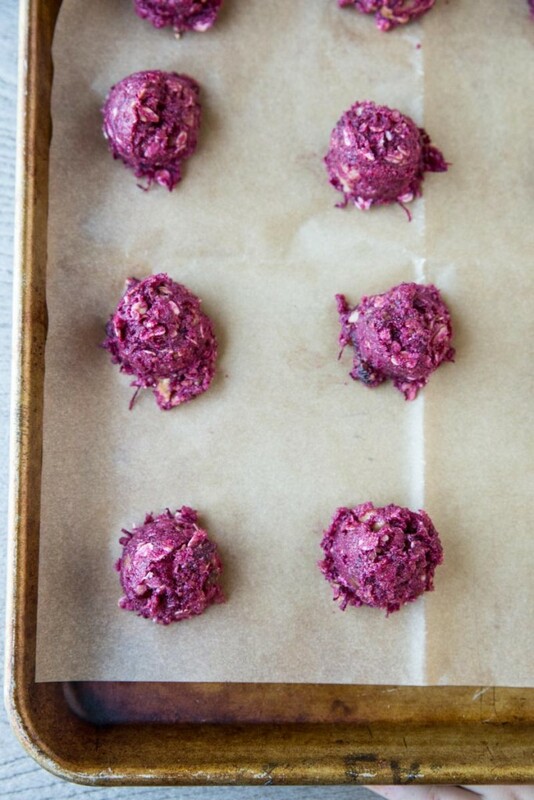 A healthy cookie recipe sweetened only with honey and loaded with energy filled ingredients like beets, walnuts, raisins, and ginger. 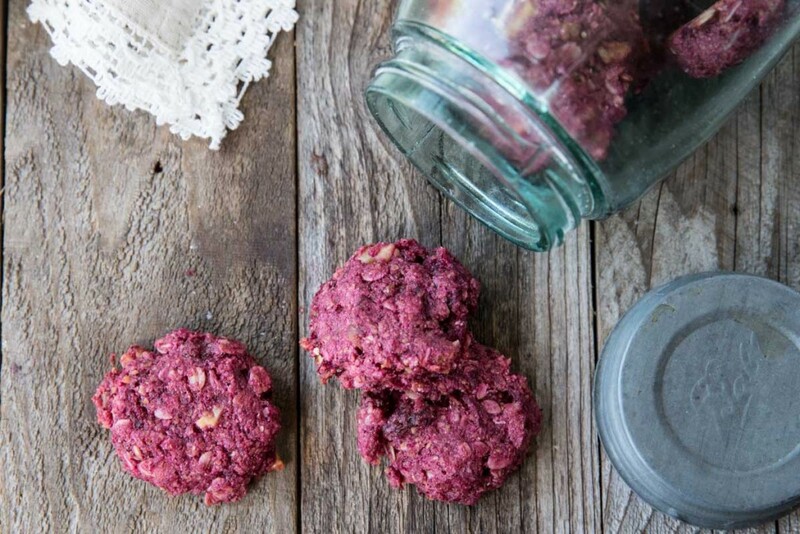 These little cookies are great to take on hikes, long runs, and any summer outdoor activity. Preheat oven to 350 degrees and set out a baking sheet lined with parchment. Peel and grate the beets on the smallest grate. Set aside. Toast the walnuts in a small baking dish for 8 minutes, then set aside. Mix together all of the dry ingredients - flax seeds through cinnamon. 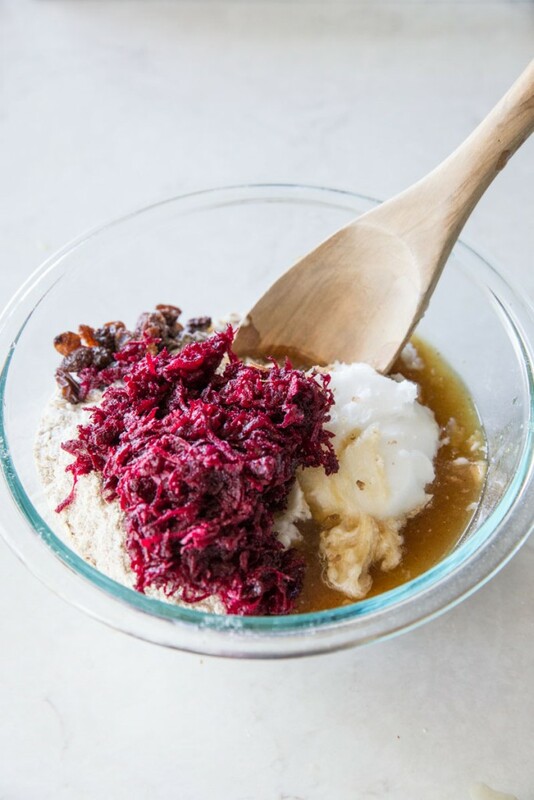 In a separate bowl, mix together wet ingredients - coconut oil through vanilla. Use a spatula or wooden spoon to combine wet ingredients and dry. 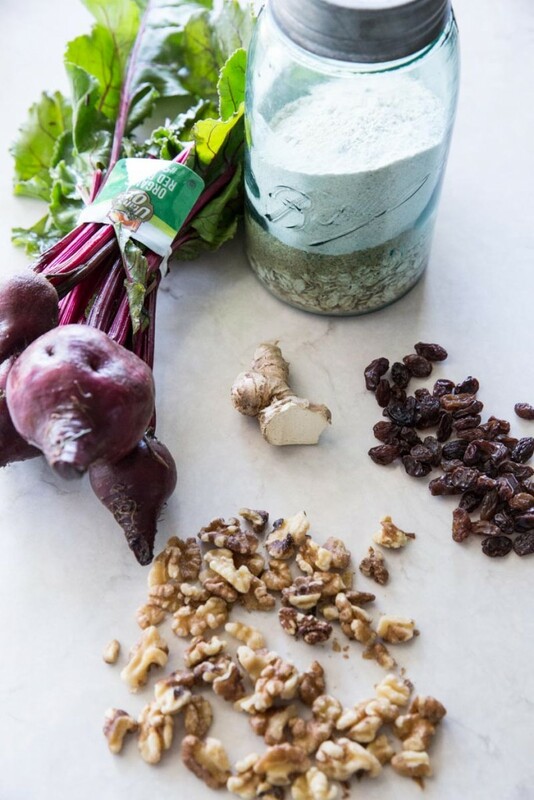 Stir in beets, walnuts, raisins and fresh ginger. Spoon out into 1-3 tablespoon sized cookies (depending on if you want smaller bite size cookies or larger ones). You don't need to space them out very much because they won't spread. Press each ball down slightly with the back of a spoon. Bake for 12-16 minutes depending on the size of the cookies. Shredded beets can be substituted with carrots. These look amazing. 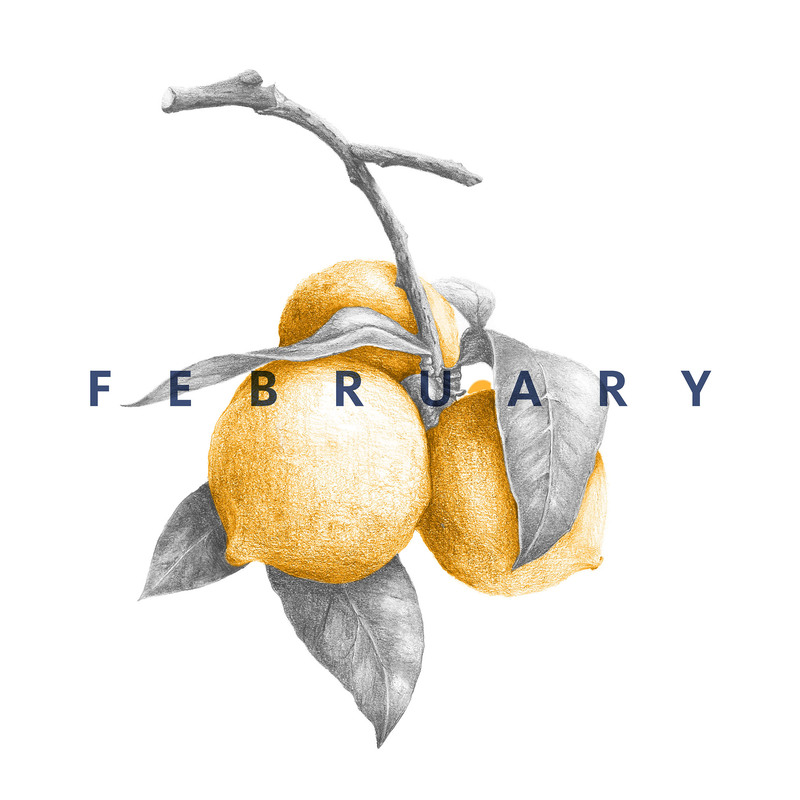 I am sharing them with my CSA members and Pinning them– and making them SOON! YAY!! I’m glad someone besides me thinks they look appetizing 🙂 I promise they are yummy! Hope you’re enjoying your CSA!! Yum! I made these tonight for my toddler. I couldn’t stop eating the batter and loved the finished product. 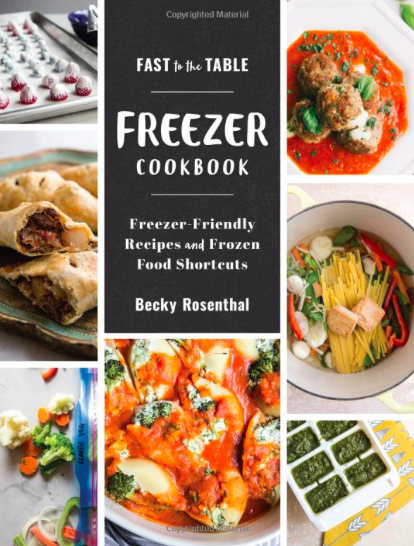 Recommendation for your next batch – I subbed applesauce for orange as I was out and added zest. It really complimented the beet, cinnamon, and ginger taste. Love your ideas! Thanks so much for sharing! I’m looking forward to my littlest being able to enjoy these too! My 4 year old is obsessed with them! Just printed the recipe will try soon! Janice, these are pretty fun for healthy cookies. Hope you like them!